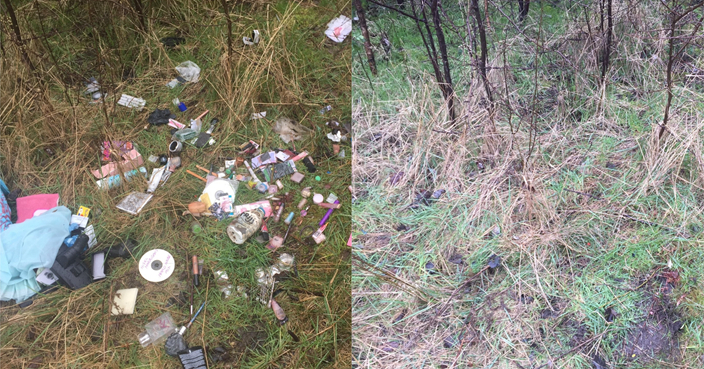 Social media users have been sharing pictures of rubbish strewn areas. A challenge of a new kind has been trending online, encouraging users to pick up rubbish and share the before and after pictures on social media. The hashtag #trashtag has been circulating on Reddit, Twitter and Instagram, with people across the globe cleaning up their local areas. The challenge, which went viral over the weekend, has been praised by users, with many posting pictures of themselves litter picking areas previously strewn with rubbish. One regular litter picker getting involved with the clean-up hopes the trend will continue to gain popularity. Twitter user @AJDelusion, who tends to an area in Oldham, Greater Manchester, said: “I’ve adopted an area there that I attempt to keep clean. “I tagged one of my regular litter picks tweets with the #trashtag, as I hope the challenge will encourage people to also help clean up their local environment, and also to raise awareness about the litter problem the country is currently suffering from. “I hope it removes any stigma people may feel about litter picking, and also lets people know that it’s something that anyone can do. The trend has seen users filling up rubbish bags at beaches, parks and fields, often accompanied with a message of encouragement to get their followers involved.